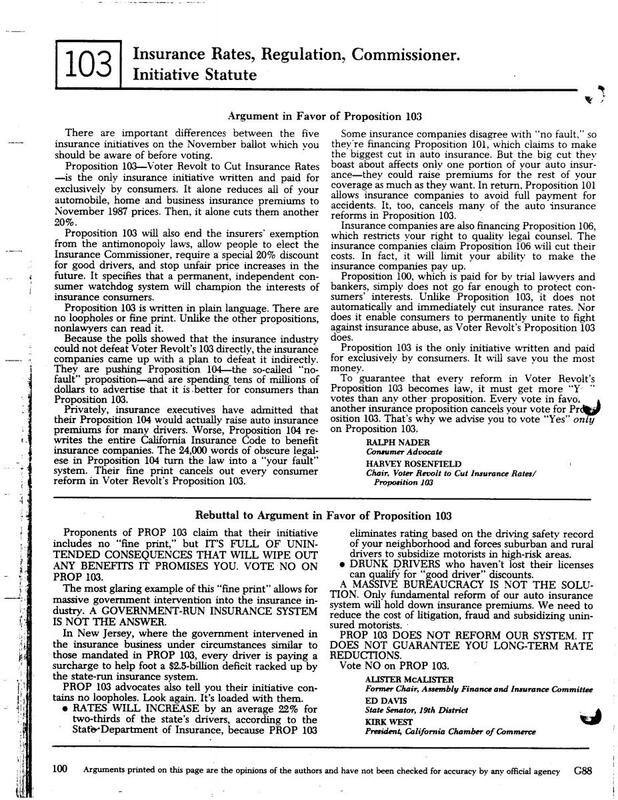 In 1988, Californians revolted against excessive auto, homeowner and business insurance premiums and passed Proposition 103, a ballot measure written by Consumer Watchdog founder Harvey Rosenfield to rein in insurance companies. Using the provisions of Prop 103, Consumer Watchdog has lowered rates and saved Californians over $100 billion over the last twenty-five years. Today, Consumer Watchdog's legal team and advocates scrutinize all major rate hike proposals made by auto and home insurers in California and play an integral role in many of the regulatory actions enacted by the California Department of Insurance. Track the rate hikes we're currently fighting or have already defeated. It pays to know your rights! Read up on each provision of the proposition. Information on the legal status of each provision. Read a history of the $80 million "David vs. Goliath" battle to reform California's insurance industry at the ballot box. Excerpt from Harvey Rosenfield's University of Memphis Law Review article on Prop 103. Explains the purpose and impact of the proposition's main reforms. Back in 1988, insurance companies spent $80 million in their campaign to defeat Prop 103. We beat them, but that was only the beginning of the battle. Since then, insurers have spent millions on ballot initiatives, lobbying and political contributions all geared toward undermining the voter-approved reforms. In 2006, insurers unsuccessfully sued to block implementation of Prop 103 rules requiring auto insurers to base premiums primarily on driving safety record rather than a motorist's ZIP Code. 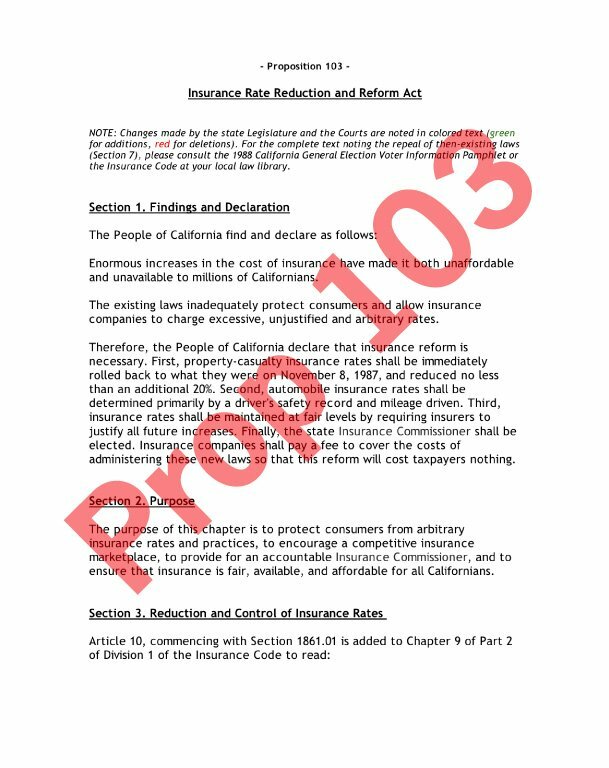 In 2010, Mercury Insurance sponsored Proposition 17, which would have repealed Prop 103's prohibition against discriminating against customers who didn't have auto insurance at some point in the prior five years. Consumer Watchdog's advocacy affiliate Campaign for Consumer Rights successfully defeated that proposal. Insurance companies oppose regulation and other reforms that limit their conduct. Instead, they lobby for legislation that restricts, rather than expands, the rights of consumers -- "tort reform." There are big differences between consumer-backed reforms and the insurance industry campaign, backed by other industries, to restrict the right to go to court. Read the fact sheet we've put together to outline the differences. For years, insurers have also tried to replace the personal responsibility insurance system - the driver who causes the accident is responsible for the damages - in California and most common in the U.S. with highly inefficient and unfair "No-Fault" auto insurance schemes. Read a brief history of No-Fault and our report, The Cost of No Fault Auto Insurance, about the failure of No-fault around the country. A critique of the many positive studies conducted by the Rand Corporation is available here.